Ted: [jiggling his cell phone, which has no signal] Papa needs a new pair of bars. Considering my son specifically picks this movie over the first tells me it's a great film. There's a good chance that he's used to the voice of the man in the yellow hat as he's the voice actor from the TV show. He also loves trains so that could be other reason. For me the animation is very good and while I found the character voiced by Jamie Kennedy to be off putting I still dug the movie. The soundtrack is pretty good for a direct to video movie. I don't think I would've seen this in the theater but it was a great deal for $10. 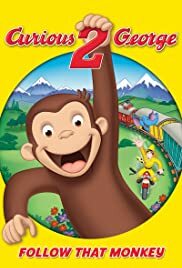 Based on the fact that the rest of the Curious George videos released have been TV show episode collections ... I have a hunch that there won't be another movie released for some time to come.